Dozens of people gathered on the Enfield town green Sunday to remember Justin Brady, a junior at Enfield High School, who died last week. The 16-year-old’s classmates, community members and his older brother, Sean, attended the vigil. “My brother had a way of listening and actually caring when people talked to him. He gave you his all,” Sean Brady said. Enfield police said Justin Brady was stabbed to death after going to fight another teen on Hoover Lane. Police have arrested 18-year-old Shyhiem “Trey” Adams, who is charged with first-degree manslaughter. On Sunday, Justin Brady’s loved ones laid flowers, prayed and wrote messages on balloons. “Forever in my heart. Rest Easy,” one message said. 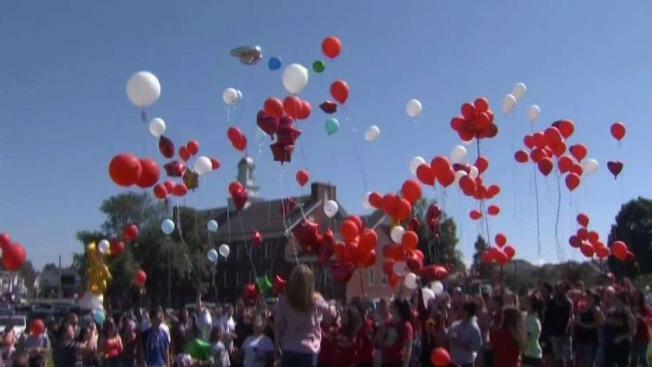 And then the crowd released balloons to the blue skies above in remembrance and also as a promise to be there for the teen’s family, which appreciates the support. “It meant a lot because it shows there’s a lot people that care about my brother and a lot of people are hurting because he was such a good, kind-hearted person,” Sean Brady said. Adams is being held on a $750,000 bond and he’s expected in court on Sept. 24.